Decorating my home for Christmas brings so much joy. I love when Jeff lugs the big boxes down from the attic and piles them in the family room. This year Afton really got into unwrapping each ornament and delighted in seeing the decorations again. It was almost like Christmas morning! Throughout the process, the house was destroyed, and then made new again. All in all, we probably spent two days living in chaos before everything was set right. But the process itself was actually enjoyable. I like to change my decor a bit every year, while still honoring our traditions. Truly this is the most wonderful time of the year- a chance to celebrate, rejoice, and reflect. 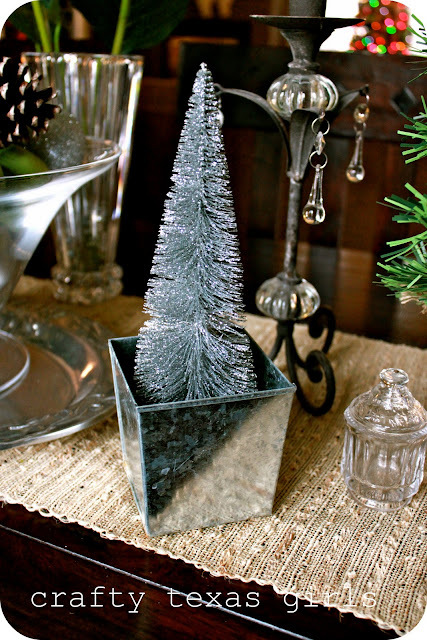 Over the next few posts, I thought I would share a few of my ideas for Christmas decorating. I would love to see yours too. So if you have a blog, share your link in my 'comment' section and I promise I will stop by. If you aren't a blogger- send me a photo. I would love to see what you are up to in your home. Today I thought we would start with table decor. You may remember a few posts ago, I wrote about 'tablescapes' and the decor tips that Pottery Barn shared with my MOPS group. 'Tablescape' is just a fancy word for what you put on your table. No rules, just a fun collection or a group of items on display. The tablescape can be on a side table- maybe a few framed photos. I like to display the photo we take every year with Santa. Next to it I mounted a vintage Christmas card (it was my grandmother's when she was young) on a book page. The lights from the tree reflect off the glass, making it feel even more magical. Or a use a sideboard, buffet table, or even a dresser in the hall to host your tablescape. I have a growing collection of nutcrackers, they seem happy gathered together here around our new advent calendar. 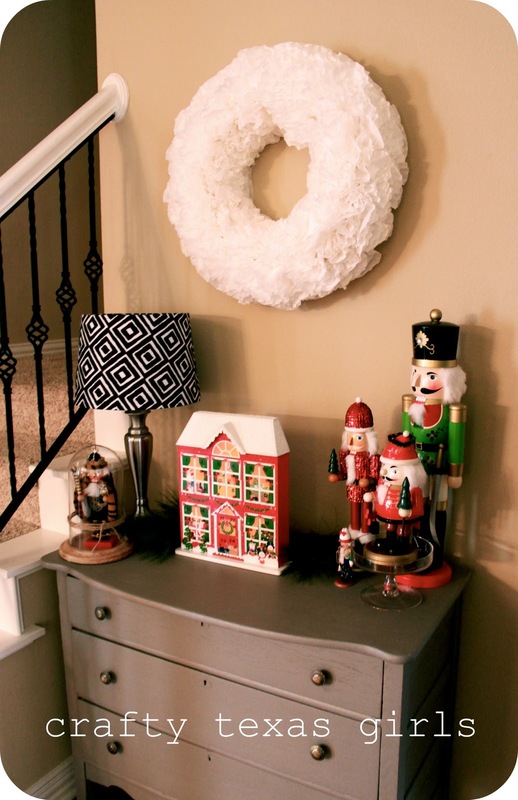 My coffee filter wreath from last year made a move from the mantle to the hall. 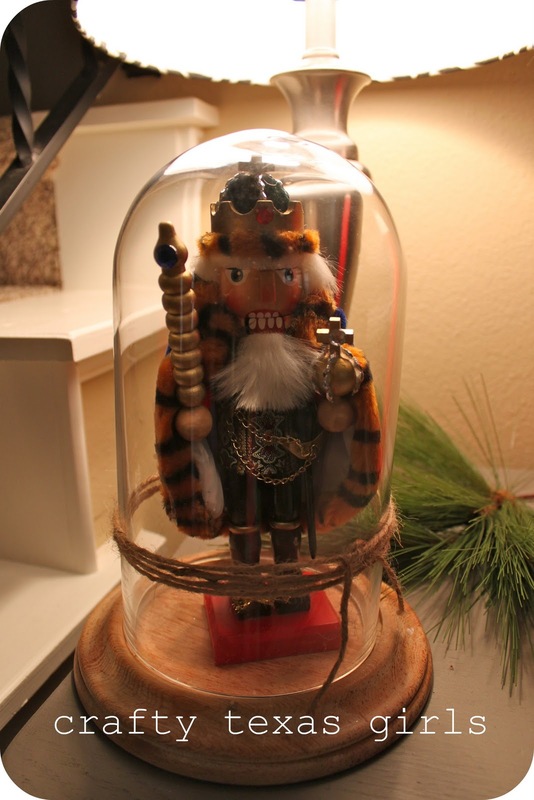 Try putting a Christmas item under a glass cloche- instant beauty! Throughout the rest of the house, I added a little 'Christmas cheer' using tabletop trees and framed printable art. I love the burlap tied with black and white ribbon! 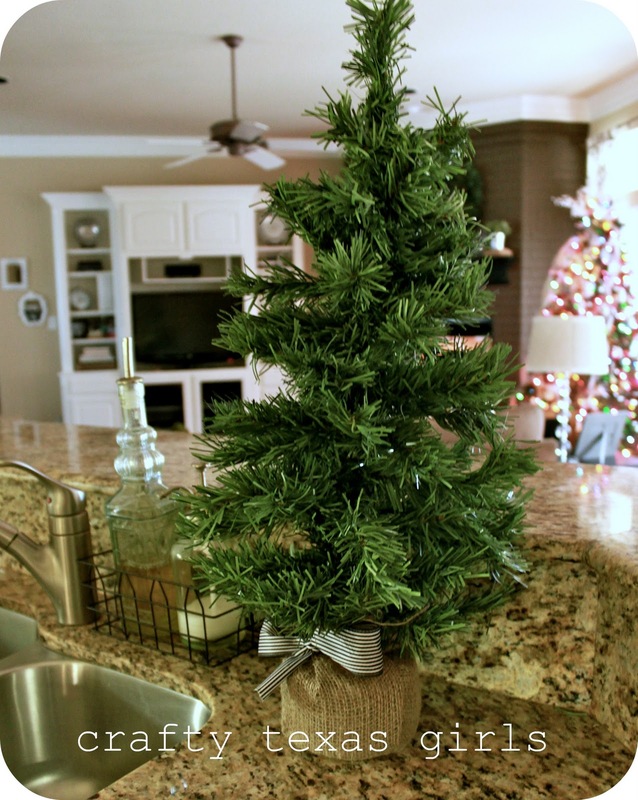 Do you enjoy decorating your home for Christmas? 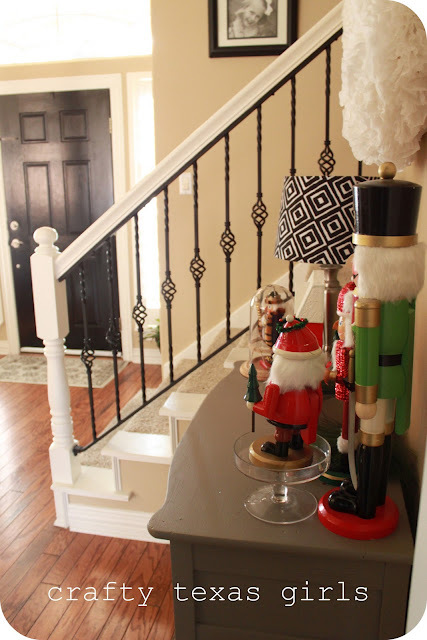 How would you describe your Christmas decor style? Do you have a 'pop of red' like this?! 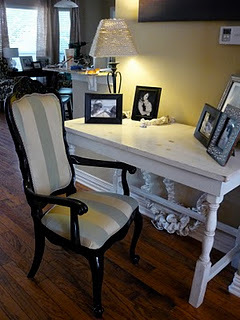 If you get a chance, stop over and visit "Remodelaholic"- so excited that she is featuring my desk chair in a post called "Upholstery for the Impatient DIYer". 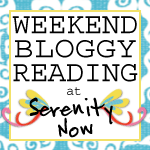 Hi Samantha - I love your blog - it was the first one I ever read and you got me hooked. I also follow your FB page - your such an inspiration. I started my own blog about 2 weeks ago - nothing near as polished and lovely as yours but Im hoping to get there one day. Please pop over for a visit. Your Christmas decor is amazing, thank you for sharing with us all. Love your ideas and your blog, I follow along each day. Please go over and visit my blog. The furniture that is holding the Santa Collection I refinished myself. Natalie! Thank you for your sweet comment. I love your blog! So happy to provide some inspiration. You have a ton of great ideas too. I adore the washer jewelry and popsicle stick art. Your little ones are adorable. Thank you for reading! Hi Sherri- So glad you are enjoying my crafty adventures. 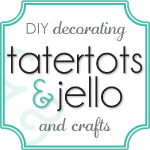 I stopped by your blog and found so many great projects. That 'perpetual calendar' is a wonderful idea. Can't wait to see what you create next!